“Failed to connect to server, please check your connection and try again. Press OK to retry” to no success. I am connected as far as internet and data is concerned because all my apps are running normally. Hey @Benz0. Are you still unable to connect to the server? I am also having this issue its been 2 days now... any1 figure out how to fix it? 3 days now, and still can not load game.does this affect paying customers also? 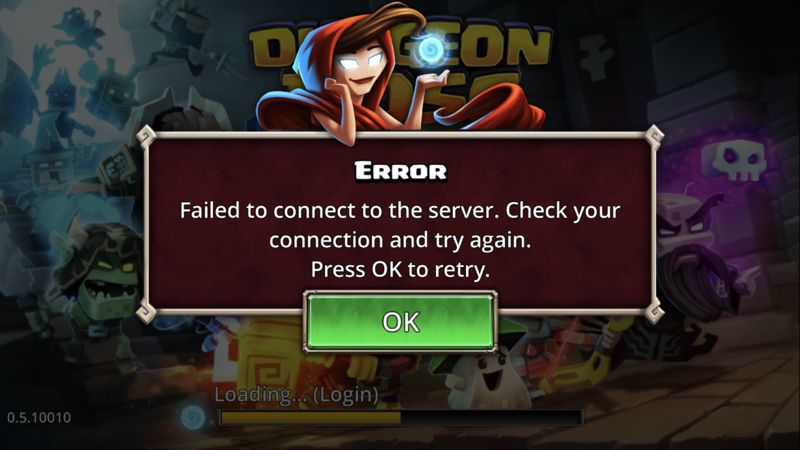 If you are still getting a failed to connect to server error, please try uninstalling and reinstalling the game. When you reinstall, you'll probably get a new account. Please make a Boss Fight account with that new account and then send customer support the DBID of your new account and the DBID or username of the account you want to recover. We're working as quickly as possible to get people back into the game. So your wanting me to lose all of my game? What makes me think that if you cant recover my current game,what makes me think you can recover after deleting my current game. For those of you on Kindles, Amazon Apps is only up to game version 0.5.10781. The newest (android) version appears to be 0.5.11437. If that alone isn't the problem, then I'm guessing that you are like me and play on two devices (Kindle and an android phone), where playing the newer version and saving data to the server is probably now preventing you from opening the older version of the game. Been there, gone through this a dozen times with Amazon. Having same problem. Cannot connect to the server. I was able to login this morning but was unable in the evening. @Joel , I saw the comment about uninstalling and then creating a new account to request that old accounts be recovered. I do not believe that I had a BigFish account, and because I keep getting the server error when logging into the app I cannot access my DB ID. Is there any way at all to recover my account? Please help in any way possible, I have been unable to access the game for over a week now and I just now found your comment here on this site. Our Amazon update is LIVE! I tried this over a year and lost all progress on my account. Customer support never responded and I quit the game for over a year. I only recently returned when I figured out how to recover it my self - roll back my phone to an older backup. The backup system seems to have improved since then...still not sure I would risk it. Backup your device first. Hi, I am also having the same problem since I opened my iPad this morning. I am very nervous about deleting in case it can't be recovered, I have just reached level 79, have all characters, and Legend 1 for PVP...eeek. This is the second issue I have had in a week, what is going on?